Map to festival locations – and “Filmmaker Meet & Greet” reminder! 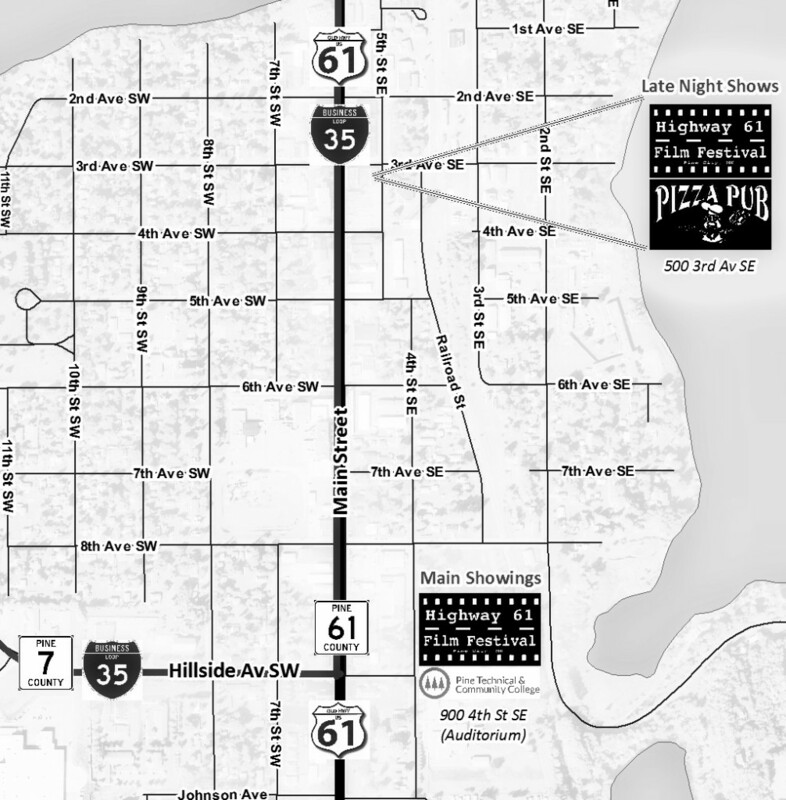 Below you’ll find the map to the two sites of the 2014 Highway 61 Film Festival. If you’re coming in from I-35, take the south Pine City exit and head east on Hillside Avenue. Go through two stoplights, and you’ll see Pine Technical & Community College right in front of you. There’s plenty of parking in the parking lot, and you can grab a bag of hot buttered popcorn from the red wagon on your way in! When you’re heading to the 10pm shows at Pine City’s Pizza Pub, take Hillside Avenue back to Main Street and turn right. Continue south through the stop sign. We’re having major construction on 3rd Avenue, so your best bet is to turn right on 4th Avenue. Frandsen Bank and Trust has very generously allowed us to use their parking lot on Friday and Saturday nights, so pull in, walk around the block to Pizza Pub and come on in. And … hey filmmakers! Planning to come up to Pine City for the festival on Friday or Saturday night? Between 9-10pm, make sure you’re at Pizza Pub for our “Filmmaker Meet & Greet.” It’s a chance to exchange ideas and enjoy some food and a beverage or two before the 10pm movies start at the same location. See you there! Next PostNext Al Milgrom returning to Pine City today!